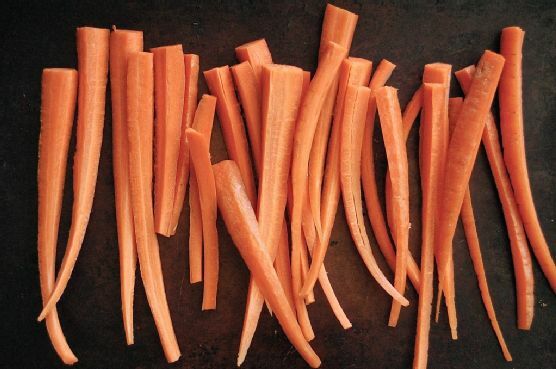 Cut off tops to carrots and rinse carrots clean. I prefer my carrots unpeeled, but you can peel them if you'd like. Cut the carrots in to long fries. Place carrots on a baking sheet. In a small bowl mix together mustards, maple syrup, and coconut oil. Microwave mixture for 30 seconds [to help melt the coconut oil]. Spoon mixture over the top of the carrots and with your hands toss the carrots so that the mustard coating covers all the carrots. Spread carrots out in to an even layer. Roast carrots for 20-25 minutes. Carrots should be tender and have that roasted edge to them. Remove from oven and sprinkle carrots with salt. Place carrots on a serving tray and enjoy.